Hey y'all! 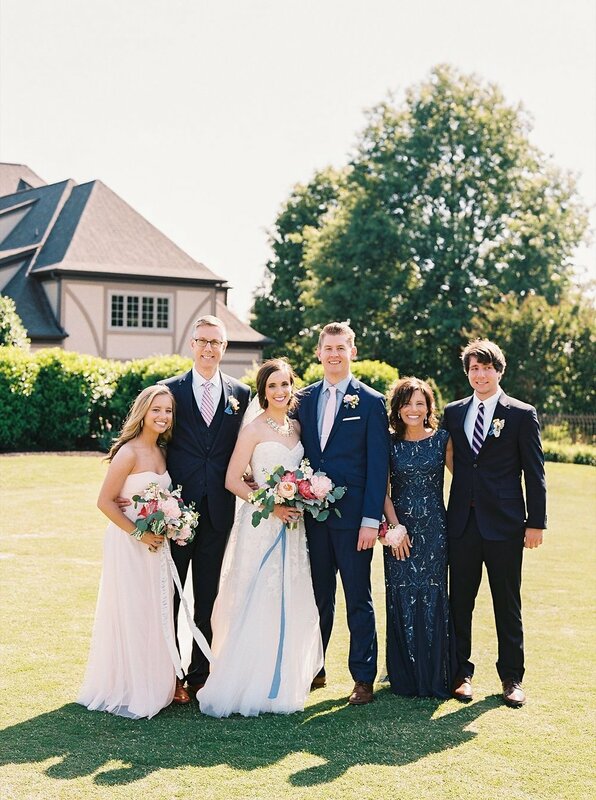 For those of you who have been following along with our wedding series and read along with our wedding feature on the Southern Weddings blog, I wanted to share another fun post today all about our favorite bridal party and family photos! 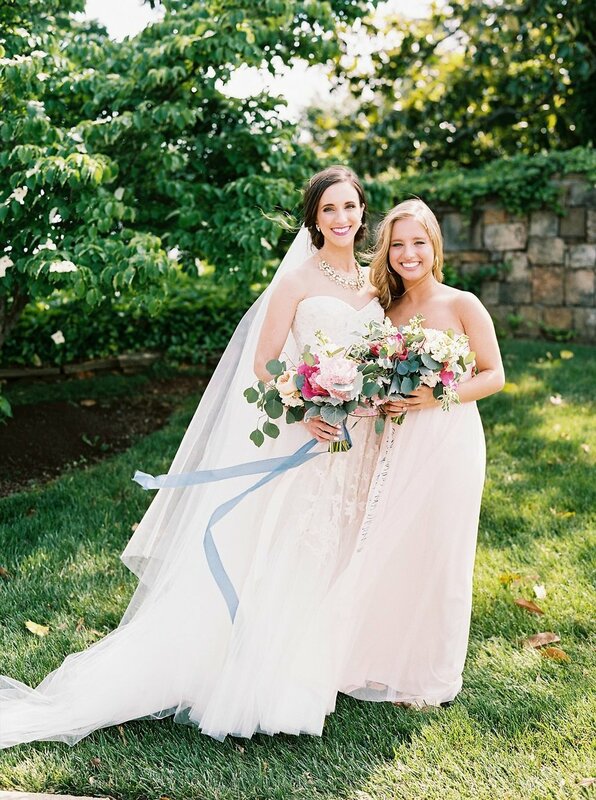 While our detail photos are gorgeous and we put so much heart into every design element, these people are truly the core of our lives and were what made our wedding day so special! As always, a huge thanks to miss Perry Vaile for capturing these stunning photos and our emotion from the day! 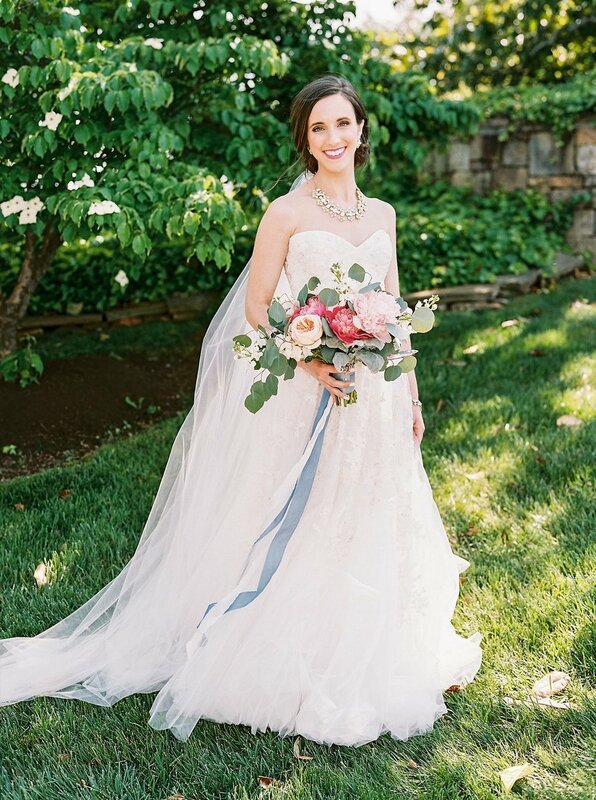 I absolutely loved my long Cathedral veil from BHLDN, but goodness did that thing blow in the wind! Luckily I had some friends to help me walk around as gracefully as possible on our wedding day! Zack and I love our friends and family so much, that there simply was not a way for us to narrow our choices down to one Maid of Honor, one Best Man and one Flower Girl! So, we both chose to have two Maids of Honor and Best Men - one sibling and one best friend - and we asked all five of our younger cousins to be our Flower Girls and Junior Bridesmaids! We loved being able to include everyone in this way, and would not have changed a thing! Plus, how stinkin cute are our flower girls?? 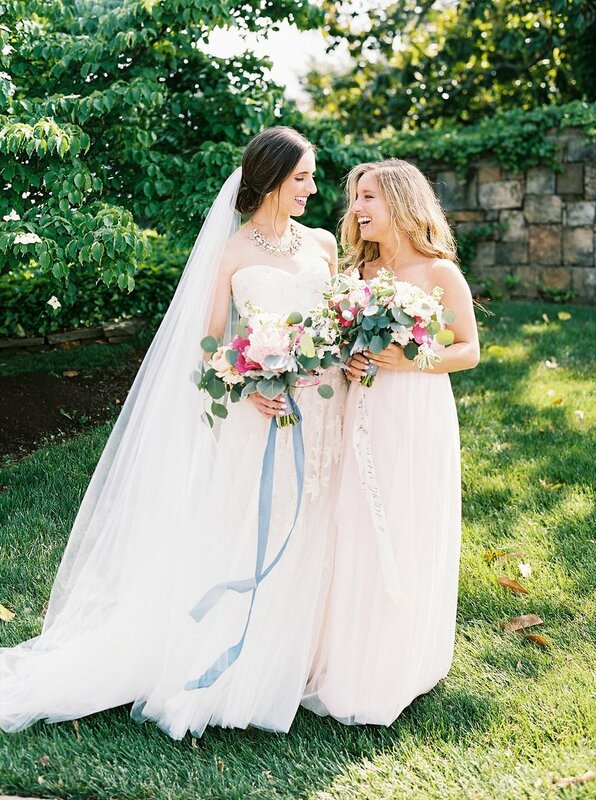 I love their sweet tulle and lace illusion neckline dresses paired with blush floral sashes, pearl bracelets (my gifts to them!) white bows, and mini bouquets! They look like such darling little ladies! 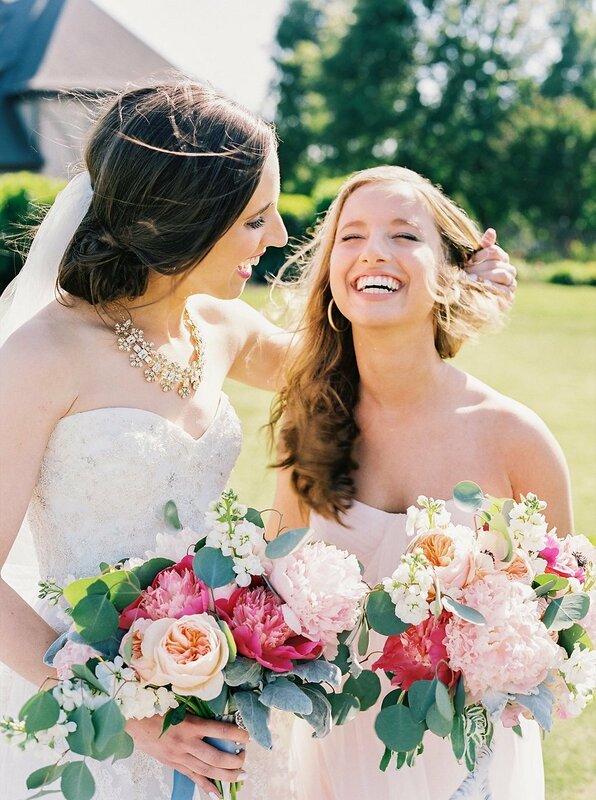 Often the bride's bouquet is the showstopper, but I wanted my bridesmaids and maids of honor to feel just as special! So, I calligraphed a sweet quote, "a single rose can be my garden, a single friend, my world" on soft silk ribbon to be tied around their bouquets. I love the texture and pop of color the calligraphy provided! If you are interested in adding some extra art to your gorgeous bouquets, I recently added ribbon calligraphy to the SJM Wedding Shop! You can read all about the details here - I cannot wait to hear your unique ideas! Aren't Zack's two Best Men so dapper as well? 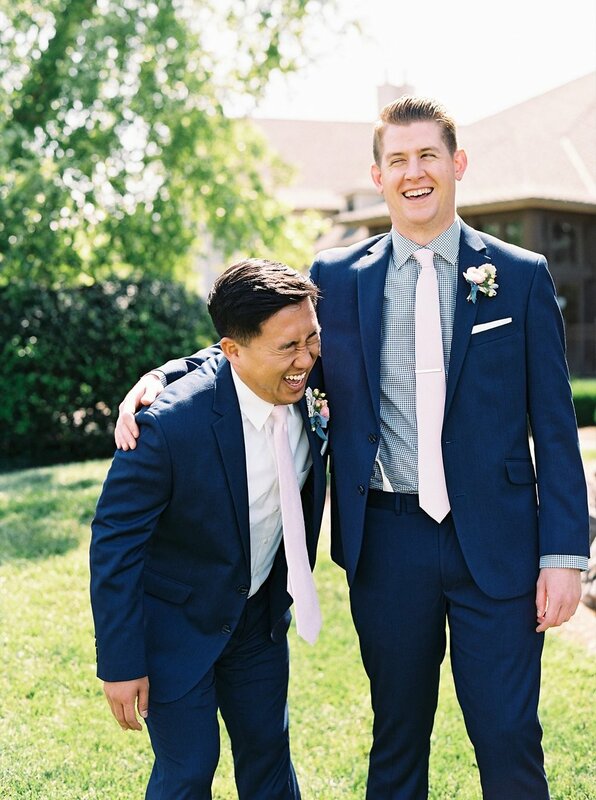 I love these candid laughing photos of him and his Best Man Dave - they might be some of my absolute favorite photos from our wedding day!! Naturally since we got married at a golf course, the boys had to practice throwing golf balls in between photos to see who could throw their golf ball the farthest! Anything to keep them entertained! Here's a glimpse into what is to come in the future - a gaggle of little girls in our family per chance?! We're thinking of starting slow by getting a puppy within the upcoming year, babies will have to wait a little while longer! I love these sweet personal photos with my family, Perry did a beautiful job capturing these emotions! I particularly love my Grandma's reaction to seeing me for the first time - it was as if we were having our own first look! 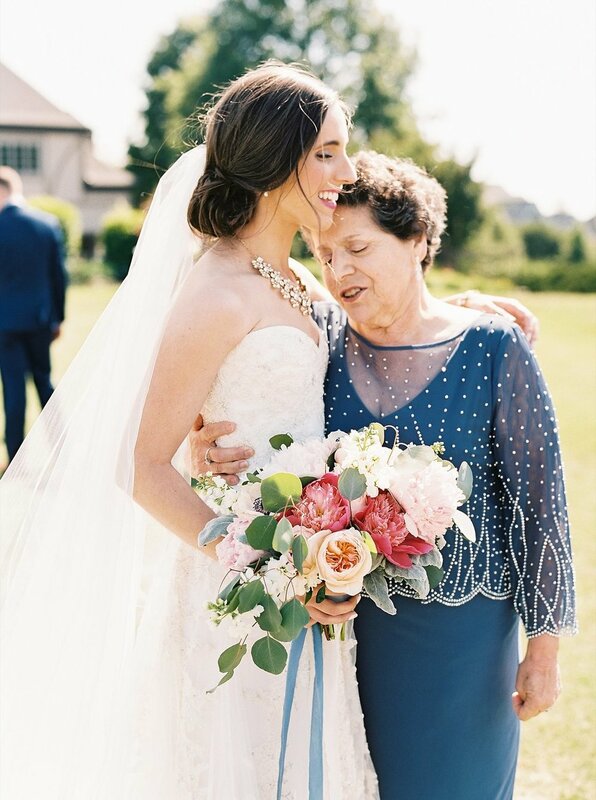 She always calls me her little princess, and she truly made me feel like one on our wedding day. And that photo of me and my dad? Well goodness, I am for sure going to have to get that one framed! Did I happen to mention how windy it was on our wedding day? There was a huge gust of wind while Perry was capturing the photos of me and my sister, and I am so glad that she decided to keep snapping these shots! I love the real moments here where I am trying to fix Julia's hair to no avail. Such a true big sister little sister moment. These will be keepers for years to come as well! And of course, we had to take classic family portraits! We are both so thankful that our sweet family was able to travel from all across the country to be with us on our wedding day. 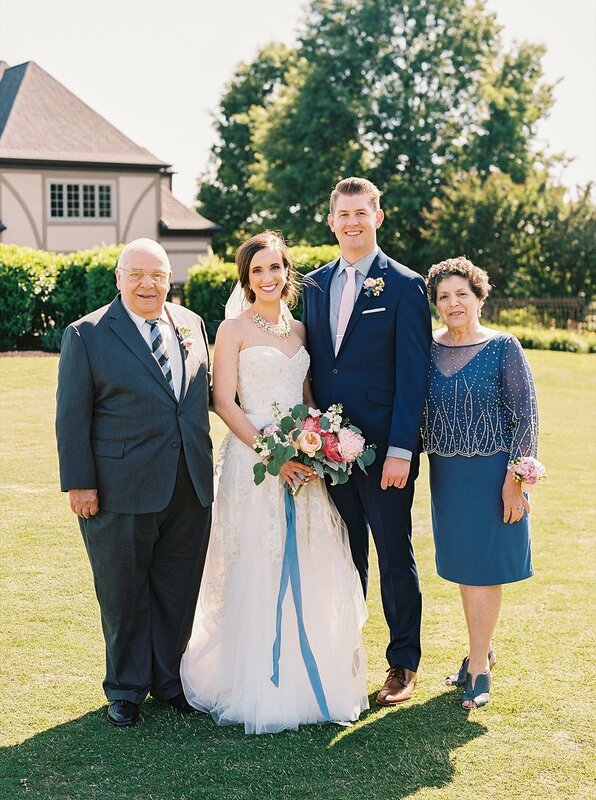 Our parents were a bit apprehensive about letting our relatives see us before our ceremony, but I am so glad that we did so that we could spend some time with them before all of the festivities started, and so we could have these beautiful photos taken!